I was flipping through the pages of the February Elle magazine…flipping-flipping-flipping…then page 65 and WOW!!! 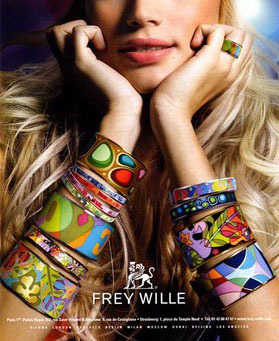 The designs from jeweler Frey Wille literally jumped off the page. (The home page photo is the photo in Elle.) There is enough inspiration on this web site to keep us busy all year. When I mentioned Frey Wille in an earlier post on Tips n’ Trends I had no idea what a fabulous resource this could be. 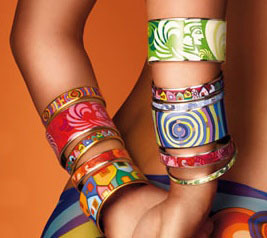 Banner photo by Emilio Pucci. Oh WOW is right. I’ve been working on bangles .. thanks for the inspiration. Thank You!!! BTW…love your new bangles. Be careful…they are addictive!!! My goodness – just how beautiful are they? I could spend a lot of time on that site just gazing!! Thank you for posting! I agree. I have dreams of canes dancing in my head. Geez these designs are awesome! Makes me think that I need to push my boundaries further and inject a little more modern edge to my own designs! Thanks so much for passing along this inspirational designer! Aren’t they amazing? Thank you for taking the time to check out the blog.